Why Do Adobe Reader and Java Update So Often? Talk about a couple of nags. 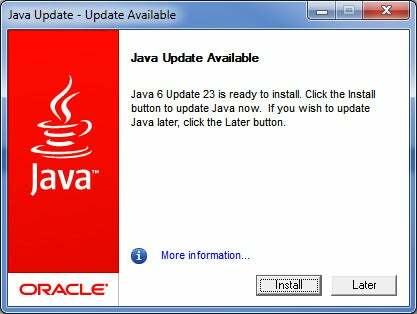 Adobe Reader and Oracle Java are almost constantly asking to install new updates. What's with these two, and do you really have to accept all the updating? Hackers can exploit Adobe's Reader (which opens PDF files) and Oracle's Java (a platform that runs various programs and Web apps) to wreak havoc on your PC. Some Reader and Java updates will improve the software's performance or stability, but most are made to plug security holes--so you should definitely install updates as they become available. But if you want to reduce some of the hassle, consider ditching Adobe Reader (which, like Windows, has a huge hacker-target on its back) in favor of a smaller, less-bothersome PDF viewer. A few good options include Foxit Reader, Nitro PDF, or Nuance PDF Reader. As for Java, well, you're pretty much stuck with it. Take note, however, that the sneaky Java updater will try to slip the Yahoo Toolbar onto your PC.